During the summer of 2010, scientists studying Fermi Gamma-ray Burst Monitor (GBM) data found that the Crab Nebula had gotten fainter by 7% from the start of the Fermi mission in 2008. This does not immediately sound like such a big deal, because many of the objects GBM sees can get very bright or very faint quickly. However, the Crab is special. It is a supernova remnant and pulsar (that rotates every 33 milliseconds). About 90% of the light we see with GBM comes from the supernova remnant and surrounding nebula. 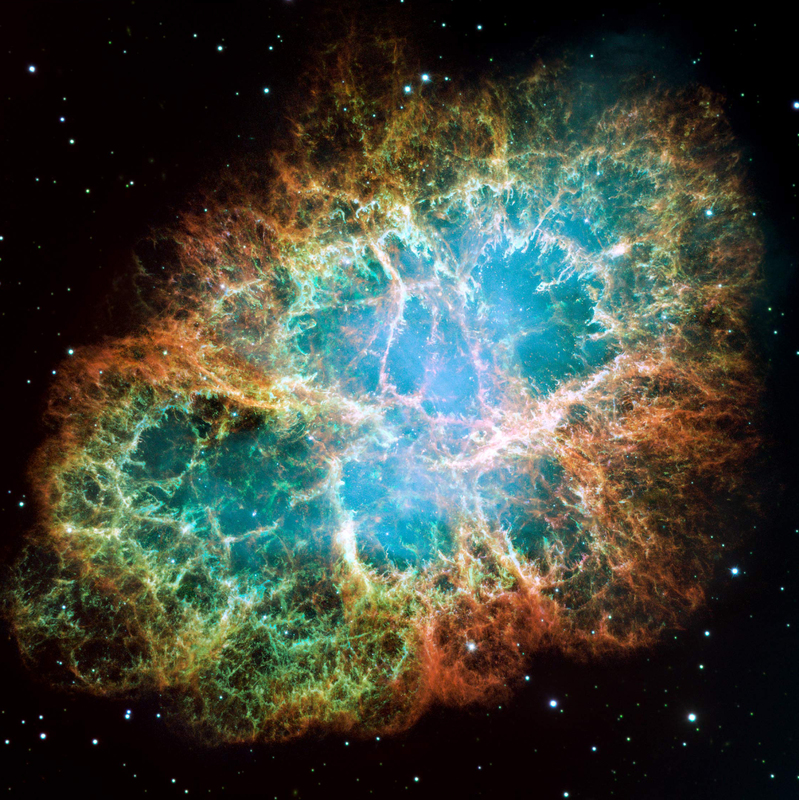 The Crab is the brightest steady source in the sky, and because it is steady, it has routinely been used to calibrate instruments and to define how bright other X-ray and gamma-ray sources are. We have a unit called the millicrab, meaning that something that is 1 millicrab in brightness is 1/1000th as bright as the Crab. At first we thought something was wrong with GBM, since we, like many other scientists, were used to thinking of the Crab as constant, and yet we had data showing that our "meter stick" had changed by 7 centimeters! So as any good scientist would do, we went out and found other satellite data to check our measurements. First we compared to the Rossi X-ray Timing Explorer (RXTE) and the Neil Gehrels Swift Observatory - and we found the same change! 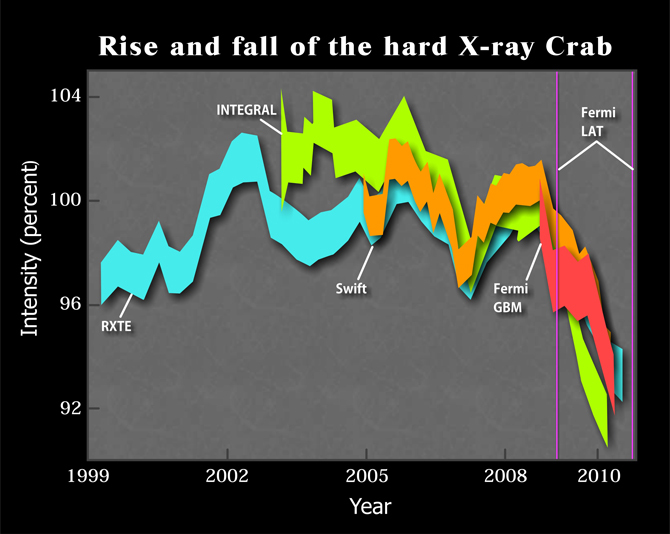 Looking farther back in time with those two observatories, with RXTE going all the way back to 1999, we found that the Crab was varying by about 3.5% per year from 1999-2010. We added more data from three different instruments on the European International Gamma-ray Astrophysics Laboratory (INTEGRAL) and the Monitor of All-sky X-ray Image (MAXI). Other instrument teams had seen the variability in their instruments, but didn't believe it, because the conventional wisdom at the time said that the Crab was constant. A constant source to which others are compared is often called a "standard candle" in astronomy, so our paper was titled "When a standard candle flickers." In more recent years, the Crab has varied a little less from year to year. These variations we see with GBM are likely related to the high energy flares seen from the Crab with the Fermi Large Area Telescope, but the details of how they are related are still a work in progress. Unlike rapid transients (like gamma-ray bursts), GBM uses a different method, called the Earth occultation technique, to measure the brightness of steady or slowly varying sources like the Crab. GBM is not a pointed instrument, so it collects all of the photons that hit it, without information about which direction the photon came from. A source being occulted by the Earth. When a source goes behind or exits from behind the Earth from Fermi's point of view, we say that it is Earth occulted. At that time, the total number of counts seen by GBM changes by a little bit (sometimes a lot if the source is bright). We know exactly where the Crab is in the sky and we know exactly where Fermi is at any given time. We also know how transparent (or not) the Earth's atmosphere is to X-ray and gamma-ray photons. Combining these things, we can measure just how much the GBM count rate changed when the Crab went behind or exited from behind the Earth. Since the Fermi orbit is about 96 minutes, Earth occultations happen about 30 times per day (15 rises and 15 sets), like sunrises and sunsets for astronauts on the International Space Station. Using the Earth occultation technique, we monitor the brightness of more than 200 sources, mostly X-ray binaries in our Galaxy. We also use this technique to look for longer-timescale emission lasting hours to days from gravitational wave counterparts, but we have not found anything yet. Rising Earth occultation step in Fermi GBM data.